Roller Shades are a clean classic look that work for any room in your home. Sophisticated but uncomplicated: for a look that’s both custom and classic, Hunter Douglas Designer Roller Shades offer a clean appearance in a beautiful range of 82 designer fabrics along with a variety of design options and operating systems including the New PowerView Motorization. Over half of these fabric styles are offered in the Harmony Program - choose the same fabric for your vertical and horizontal window fashions when you combine Designer Roller Shades with Skyline Gliding Window Panels. Keep it simple. Roller Shades have a sleek, modern design and an uncanny ability to regulate natural light and privacy in your home. Perfect for cutting down on glare and catching up on sleep. Roller Shades are easy to operate with all of the Lift Systems made by Hunter Douglas. They are the perfect window treatment for a clean, finished look. Our Designer Roller Shades by Hunter Douglas combine the ease and simplicity of a Roller Shade with hundreds of fabric choices - sheers to opaque, patterns to textures, and traditional solid colors. Our Designer Screen Shades are the best at balancing privacy with views. They offer excellent UV protection while maintaining your view of the outdoors. Our Designer Screen Shades are available in varying levels of opacity to fit your light control needs. Offering a minimal yet sophisticated shade with light control, color and style - a perfect roller screen shade for your patio or sunroom. An innovative alternative to Woven Woods and Solar Screens, The Alustra Collection of Roller Shades artfully blend unique fibers and sophisticated design to create distinctive light filtering fabrics. Designer Roller Shades and Screen Shades are one of the most popular window coverings today and they are fun to show because many of the fabrics can be used in a contemporary or traditional setting. Today more people are wanting to keep their view the outdoors. They want privacy when they need it, but also an unobstructed view when they want to see the outside. These shades are the perfect solution and the fact that there are so many fabrics and colors to choose from just makes it fun. You can also easily pair roller shades with stationary panels to finish the design look. We recently helped a customer in North Dallas who had remodeled their Family Room. She wanted an open view of the back yard as it looked onto a creek. Of course she needed privacy at night but wanted that full open view during the day. We suggested Hunter Douglas Designer Roller Shades. The fabric was called Flaunt and the color Whisper White. This shade has a wonderful texture so when it is down it looks beautiful and when it is up the fabric is tucked into a cassette head rail and you really do not know the shade is there. Hunter Douglas introduced their new Square Cassette at the beginning of April. It gives a very clean look and we love it! This customer also selected the new PowerView Motorization lift system. Because there are 5 shades in a row, the motorization just made everything easier. Next step will be adding Drapery Stationary Panels. Stop in either of our Galleries- Read Design Southlake or Read Design Plano. Our Designers are ready to show you the latest trends in Window Fashions including Designer Roller Shades, Designer Screen shades and the Alustra Collection of Roller Shade. We have all of the new products and the new sampling. We also a full Interior Design Studio and can help you with any Drapery Project including Stationary Panels, Valances, Cornices, and Curtains. You call either store and we will send out our Mobile Showroom. Read Design provides Roller Shades and all of Hunter Douglas Window Fashions to Dallas, Highland Park, Park Cities, Preston Hollow, North Dallas, Plano, Frisco, Prosper, Celina, Gunter, Richardson, Garland, Murphy, Allen, McKinney, Fort Worth, Keller, Westlake, Northlake, Grapevine, Southlake, Colleyville, Flower Mound, Little Elm, Corinth, Lewisville, Carrollton, Farmers Branch and everywhere in between. 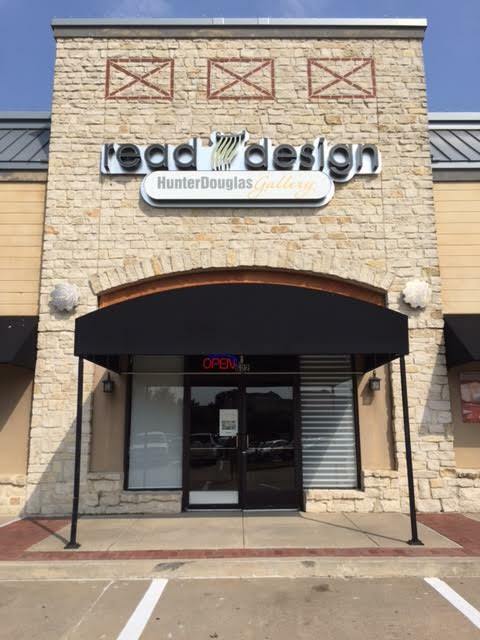 We are a Hunter Douglas Gallery conveniently located in TWO Dallas-Fort Worth areas serving residents for over 25 years. One Gallery is located in Plano in the Lakeside Market and the other Gallery is located in Southlake, right on Southlake Blvd. In addition to the Galleries, we have 2 Mobile Showrooms so we can gladly come to your home for a design consultation. When we come to your home we can see your needs and be better able to help you. We can help you with many interior design issues that need a professional eye from blinds, shutters, and shades to furniture arrangement and accessorizing. We can also help you with custom window treatments, draperies, and curtains. When beginning your interior design project, you have a lot to consider. You want to find someone that understands and listens to your needs and can help you visualize your ideas. You want personalized service that only a Small & Local Family Owned & Operated Business can provide. So Why Shop Read Design Instead of a Big Box Store? At Read Design, we are that Small Texas Business and it is our business. We make sure that we are all trained, certified, and knowledgeable on the products inside out. You can expect personalized service because we will take an interest in you and will work to find the best solution to your interior design needs. But you might ask - Would the big box stores have better pricing? Not necessarily. Big box stores can get better pricing on container products when they buy in bulk, such as mattresses, appliances, televisions, etc. But when it comes to custom orders, this is not the case. As that small business, we actually have BETTER pricing! You have to take in to consideration the huge overhead expense that the big box stores have. This would include electricity, insurance, sales force, advertising, damages and the list goes on and on. All of our window treatments including Hunter Douglas Window Fashions and draperies, curtains, and valances are custom ordered because windows are ever the exact same size from one customer’s home to the next. And no two customers have the same needs. At Read Design we do not have quotas or a revolving door of salespeople. We have a family atmosphere and a passion for design. We are here to walk you through our Gallery with over 70 working samples. We are here to show you the features and benefits of each product. We are here to listen to you and direct you to products we think might inspire you. We are here to show you the latest trends and the current styles including the new PowerView motorization. We are here to help you find the perfect solution. We are here to offer professional and timely delivery and installation. Most importantly, we are here to offer you piece of mind. We recently helped a customer who said she had been everywhere looking for window treatments for her recently remodeled home. Other companies were pushing her towards plantation shutters or wood blinds, but what we heard from her is that she wanted to be Refreshed and Recharged. She wanted privacy at night but during the day, she wanted the light to shine in and the shades to disappear. She wanted a simple, but sophisticated look. For her next project, she wants to soften the look with stationary drapery panels for her next project. For a look that is both custom and classic, Designer Roller Shades offer a clean appearance in a beautiful range of fabrics along with a variety of design options and lifting systems. Our solution for this customer was Designer Roller Shades by Hunter Douglas with the PowerView lift system. We chose a neutral textured fabric that will provide a backdrop and foundation for any color in the room. The Fabric is called Duncan and the color is Wisteria. This fabric gave our customer the updated look she wanted. And the PowerView lift system has offered her the convenience she had hoped for. Next steps are stationary drapery panels and curtains. Here we selected a Fabric from Kravet in a pattern style. Stop by either of our 2 Hunter Douglas Galleries or call for the Mobile Showroom. We are here to assist you. We are here to show you the many Window Fashion Products that are available and all of the different lift systems. We are here to help you with any Interior Design Project including Custom Window Treatments, Draperies, Curtains , Reupholstery, accessorizing and more. We want to help you become Refreshed and Recharged! Read Design helps customers from Fort Worth , Trophy Club, Keller, Westlake, Southlake, Grapevine, Colleyville, Arlington, Flower Mound, Argyle, Robson Ranch, Dallas, Highland Park, Park Cities, Preston Hollow, North Dallas, Plano, Frisco, Prosper, Celina, Richardson, Garland, Rockwall, Murphy, Wylie, Parker, Allen, McKinney, Carrollton, Lewisville, Little Elm. Highland Village and Everywhere inbetween. Dressing windows artfully and bringing light into a room beautifully can be done in many ways. Sheers and Shadings are one approach to controlling light: Shutters and blinds, quite another. Soft folds offer a softer look, while crisp pleats and flat roller shades feel more contemporary. Consider, too, how you live in a room and how important privacy is to you. Then, factor in your personal aesthetic; from sleek and contemporary to rich and traditional. You will find that whatever your desires, we have styles for every taste, every room, every moment. Control the mood in a room gently, beautifully with these options. Creating effects with soft fabrics and diffused natural light. Keep the look classic but still have all the benefits of advanced, modern-day materials and long-lasting finishes. Sophisticated but uncomplicated. For a look that’s both custom and classic, Designer Roller Shades offer a clean appearance in a beautiful range of 82 designer fabrics, along with a variety of designer options and operating systems. Over half of these fabric styles are offered in the Harmony Program - choose the same fabrics for your vertical and horizontal window fashions when you combine Designer Roller Shades with Skyline Gliding Window Panels. We recently helped a customer who came into our Plano location. She was building a new home in far north west Plano. After showing her all of the products and after listening to how she lives and what her needs are we determined that her style is more contemporary. She wants as much light as possible and will keep the shades up and will lower them only in the evening. We showed her one of our favorite, Designer Roller Shades by Hunter Douglas in the fabric Urban Loft, color – Organic Cotton. It was the perfect solution to the wall of windows in her new Family Room. We also showed her the PowerView Motorization System, and since she has a total of 4 windows and 1 door, the convenience of the PowerView motor was too good to pass up. These shades provide a clean and classic look. They give her privacy when she needs it and they open her room to the beautiful outdoors during the day. Call Read Design for all of you window fashion needs. Stop by either of our Hunter Douglas Gallery locations to see all of the new products from Hunter Douglas including the New PowerView Motorization. We will be happy to listen to you and show you the products that you might have interest in. If you'd like, we can also schedule an appointment at your home. We can even go a step further and help you with Custom Draperies and Curtains. We did attend the January Market and new, wonderful fabrics are coming in everyday.